Big Arms Q And A! Next to abs, arm questions seem to be the second most frequently asked ones. In this Q&A, I hope to Answer the most commonly asked inquiries on how to get guns for arms. How can I get big arms quickly? When training the biceps use exercises like E-Z Curls, Preacher Curls, Incline Curls, Lying Cable Curls (use overhead pulley and lie down on a bench), Reverse E-Z Curls (standing and on preacher bench), Hammer Curls and even Biceps Chins, which are performed by using a narrow underhand grip on the chin-up bar. For the Triceps, concentrate on Parallel Bar Dips, Close Grip Bench Presses, Lying E-Z Triceps Extensions (preferably on a decline bench for better effect), Overhead Extensions and Triceps Pushdowns with a bar or rope. These are all great exercises. Follow a periodized routine and change your exercise selection often. In my training experience, the biggest mistake I see most people do is following the same routine all of the time. In all of my publications, I always talk about the importance of training variety in order to continually challenge the body and continue to induce gains. Notes: If you are a naturally skinny person (a hardgainer who always has abs regardless of diet), then perform only once a week for 5 weeks before moving to routine #2. Otherwise, use a training frequency of twice a week leaving 2 or 3 days of rest in between and perform for 3 weeks before moving to routine #2). Click Here For A Printable Log Of Quick Arm Gains Routine #1. Notes: If you are a naturally skinny person (a hardgainer who always has abs regardless of diet), then perform only once a week for 5 weeks. Otherwise, use a training frequency of twice a week leaving 2 or 3 days of rest in between and perform for 3 weeks before moving to another routine). Notes: In a Modified Compound Superset, you first perform one exercise, rest the recommended amount of seconds and then perform the second exercise (i.e. : For instance, first do Biceps, then do Triceps). Then rest the prescribed amount of time again and go back to the first exercise. If you look at it, you will be resting 3 minutes plus the amount of time that it takes you to perform the other exercise (so you actually are resting a given muscle between 3 and 4 minutes). Using this technique of pairing exercises in a modified superset fashion not only saves time and keeps the body warm, but it also allows for faster recovery of the nervous system between sets. This allows you to lift heavier weights than if you just stay idle for 3 minutes waiting to recover. Remember that nutrition is key for gains. If you have an average metabolism, multiply your bodyweight times 15 to gain muscle size and use a macronutrient ratio of 40% carbs, 40% proteins, and 20% fats. If you are a hardgainer, then multiply your bodyweight by 24 and use a nutrient split of 50% carbs (even split of simple and complex), 25% proteins, and 25% good fats. Also, whether a hardgainer or average gainer, remember to have a post workout protein shake with simple carbs to spike insulin levels and induce anabolism (growth). Use perfect form when executing arm exercises. Utilizing less than perfect form will result in the utilization of other muscles in the body, thus taking away from arm stimulation. You need to concentrate and feel the biceps and triceps contract as you work them. Forget about using super heavy weights and jerking the weight. Practice perfect form and think isolation at all times. How often can I train my arms? Answer: Most people should train their arms twice a week (with 2 to 3 days of rest in between), except if they are hardgainers, in which case once a week is best. Another exception is that of the extremely advanced bodybuilder who have so much muscle mass and strength that once a week training works best. How many sets should I do for the arms? Answer: For absolute beginners, 4-6 sets twice a week works best. For intermediate bodybuilders, 10-12 sets twice a week, and for advanced athletes 12-14 sets will suffice. As you get more advanced into bodybuilding, you start learning more about your own individual recovery capabilities, but in my experience 10-12 sets seems to be tolerated well by most people. Again, remember that if you are an ectomorphic person with a super fast metabolism, once a week training is a better frequency. How can I make my arms look wide as mine look big when I flex them but small when you see them from the front? Answer: You need to train the biceps brachialis in order to create the illusion of width. 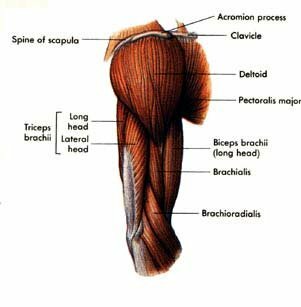 The biceps brachialis is that little golf ball shaped muscle in between the biceps and triceps that is located on the outside part of the arm. By increasing the size of this muscle, not only you increase the size of your arms but also your width. This muscle is trained with hammer curl movements and reverse curl movements as well. What other body parts can I train my arms with? Note: I always seem to get better results when I train both biceps and triceps in the same workout so while I have split them on separate days many times, 90% of the time I train them together. Hugo Rivera is an ISSA Certified Personal Trainer, Sports Nutrition Specialist and Computer Engineer graduate from the University of South Florida. Hugo is owner of www.hrfit.net, an informational, free fitness and nutrition website. Hugo is author of a self published bodybuilding e-book called Body Re-Engineering geared towards the natural bodybuilder and co-author of one of the most popular Men&apos;s Health book in the country (according to Barnes and Noble) called "The BodySculpting Bible for Men" and the very popular "BodySculpting Bible for Women". Hugo Rivera & Jennifer Searles & Dneil Gordon At The 2005 Arnold. Hugo also just released his new book called The Hardgainer&apos;s Handbook of Bodybuilding in March 2005 and also serves as a nutrition consultant to several professional football players and other elite athletes. Hugo serves as business consultant to many personal training studios as well. Hugo continues to publish several articles on the subject of health and nutrition in several magazines and websites and has been with Prolab Nutrition for over three years. Hugo competes as drug free NPC athlete at the National Level and his core supplementation has always consisted of Prolab products.